GSE (Grapefruit Seed Extract) — This food-derived substance is used by a growing number of aviculturists, pet bird owners, and veterinarians. It is a natural, safe and non-toxic disinfectant and cleaner as well as a preventive against disease-causing pathogens. This extract of the lowly grapefruit seed is effective at combating hundreds of pathogens that adversely affect birds, including parasites, bacteria, virus, and various fungi. GSE is used to disinfect food and water, to prevent mold growth on home-grown sprouts, to clean cages, aviaries and homes — all without harming the birds or the environment. To disinfect surfaces and items in the aviary and nursery such as brooders, incubators, cages and carriers, make an all purpose cleaner by adding 30 to 60 drops of GSE to a 32-ounce pump spray bottle filled with water. To prevent the growth of pathogens and to kill existing parasites, (such as giardia in well water), use one drop of Nutribiotic GSE in an eight-ounce water cup. Daily use is safe and a probiotic can be used if you are concerned about maintaining healthy intestinal flora. To disinfect towels and cloths used for baby parrots, add 30 to 50 drops to the wash cycle, or add 10 to 15 drops of GSE to the final rinse to ensure that the laundry is free of fungi and bacteria. To disinfect carpet in bird rooms, add 10 to 15 drops of GSE per gallon of water to the reservoir of the carpet-cleaning machine. Mother Nature has provided an extraordinary substance from a surprising source to benefit her feathered creatures. An extract of a simple food item has proved to be effective in combating hundreds of pathogens that affect birds, including parasites, bacteria, virus, and fungi. This food-derived substance is used by a growing number of aviculturists, pet bird owners, and veterinarians. It is a natural, safe and non-toxic disinfectant and cleaner as well as a preventive against disease-causing pathogens. It is used to disinfect food and water, to prevent mold growth on home-grown sprouts, to clean cages, aviaries and homes as well as to treat a variety of illnesses — all without harming birds or the environment. Surprisingly, this powerful product is made from the lowly grapefruit seed! The antimicrobial properties of the extract of grapefruit seeds and pulp were discovered in 1972 by Jacob Harish, a physicist and immunologist, as a result of his curiosity about the bitterness of grapefruit seeds. Dr. Wyatt’s findings have been confirmed by a variety of clinics and labs, as well as universities from around the world. GSE is non-toxic, environmentally safe, and quickly bio-degradable. It causes no side effects and is often dramatically less expensive than existing treatments or chemicals for similar applications. Some physicians have found that GSE is as effective against candida, a yeast infection, as Nystatin or other antifungal preparations. It is also effective against protozoans such as giardia or entamoeba histolytica. Researcher Dr. Leo Galland says that it is more effective than prescription medicines such as metronidazole against these protozoal parasites. There is considerable research to support the claims of GSE’s efficacy as a natural antibiotic, anti-fungal, anti-protozoan, anti-viral and antiseptic disinfectant. 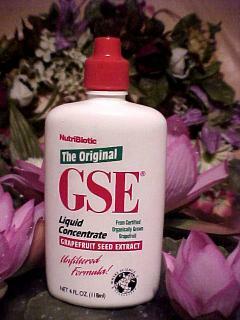 As a germicide, GSE has multiple uses and it is non-toxic and non-irritating when diluted as directed. According to The Journal of Ort*bleep*lecular Medicine, Volume 5, No. 3, USA, 1990, an international research team examined the effect of GSE on 770 strains of bacteria and 93 strains of fungus and compared this with 30 effective antibiotics and 18 proven fungicides. GSE was found to perform as well as any and all of the tested agents. To clean formula from baby parrots’ faces and feathers after syringe feedings, add a few drops of GSE to a bowl of warm water to wet the cleaning cloth. It kills bacteria and gets the skin and feathers squeaky clean. How much would you put in baby bird formula when Handfeeding ? Can you leave these cleaning solutions in bottles for a long period of time, or do they need to be frequently changed out? It will stay good for quite some time, my only concern would be with the spray bottle itself. They can create mold over time if not cleaned out properly and often. So if you are not going to use all of the mixture, say within a month. I would make smaller amounts and then wash out the spray bottle within about 30 days. If you use water and GSE to clean a cage, can the birds be left in the cage or do they need to be removed? We are currently using Natural Chemistry Healthy Habit now, but cannot always get it. My family has been using GSE since the 80s. However, they altered their formula a while ago for just the GSE you show at the top of your article. In order to get the full benefit of the compound, everyone will need to purchase the additional “Maximum GSE Liquid Concentrate with Full Spectrum of Bioflavonolds” and add this to the regular GSE.